Usually, I’m a sucker for bunnies, chicks, eggs, pastels, and all the traditional Easter decor. 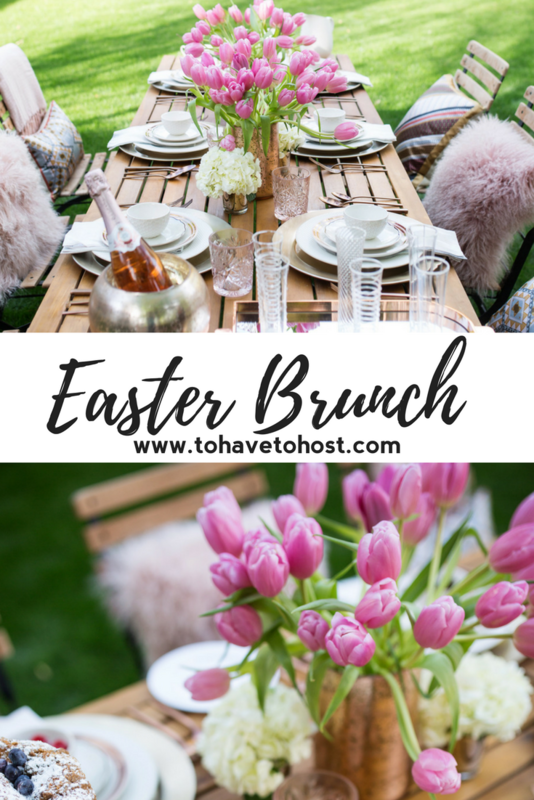 However, when I teamed up with West Elm to create this stylish Easter brunch using their Textured Dinnerware Collection, I knew I needed to go beyond novelty. I was inspired by all of the amazing rose gold elements they had in their store to usher in Spring. From dishware to florals to linens to recipes, I’ve got you covered! Read on! Rimmed in pink and gold, the salad plate was my muse for the entire tablescape. I worked around this small dish to design and compose a fun outdoor brunch. 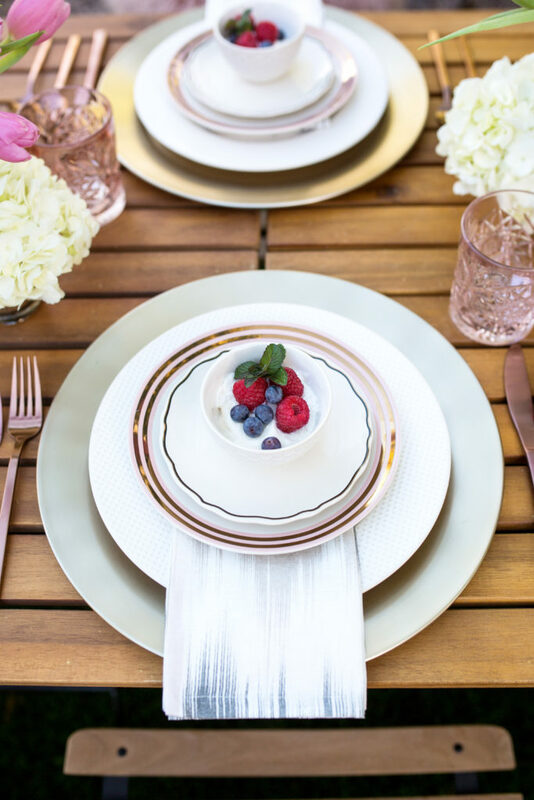 With just the right balance of shimmer and matte, these gold metal chargers worked perfectly as a foundation to build the dishware. Next, I layered West Elm’s Textured Dinnerware dot-patterned dinner plate, then the rose gold salad plate, followed by the gilded side plate. Lastly, a small dip bowl in a honeycomb pattern from the same collection, topped it all off. Do you see how nothing in this setting is the same? That’s what I love about this collection’s eclectic vibe! It all works together beautifully, and you really can mix and match like a pro. 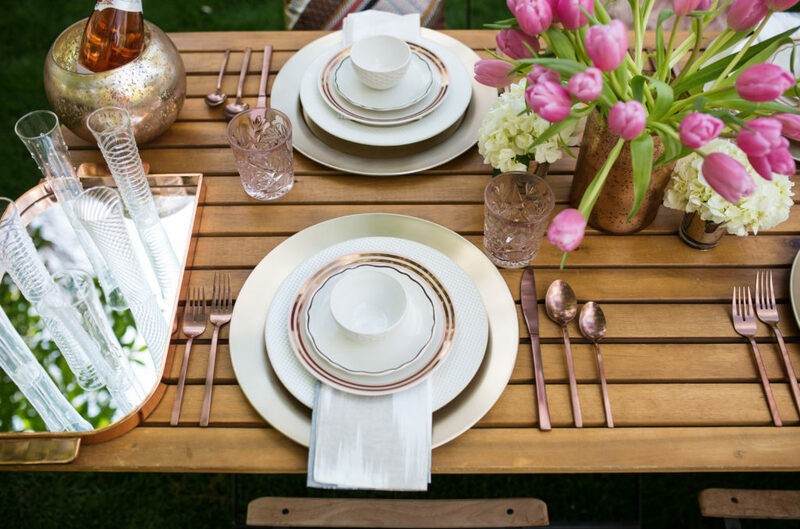 Rose gold flatware is such a gorgeous addition to the setting. I love how it plays off the tulips and the light pink hue in the etched star-detailed glassware. A subtle napkin print complements the setting without stealing the spotlight. Mercury glass can bring sophistication to any table, so I jumped at the chance to use these pieces. 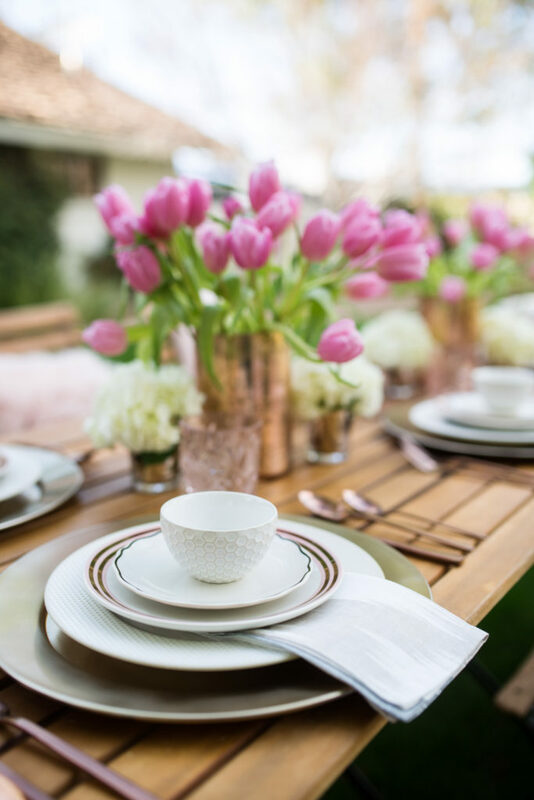 Crosshatch patterned rose gold vases lent themselves beautifully to the blossoming pink tulips, while the bulbous vases served as my rosé Champagne vessel. 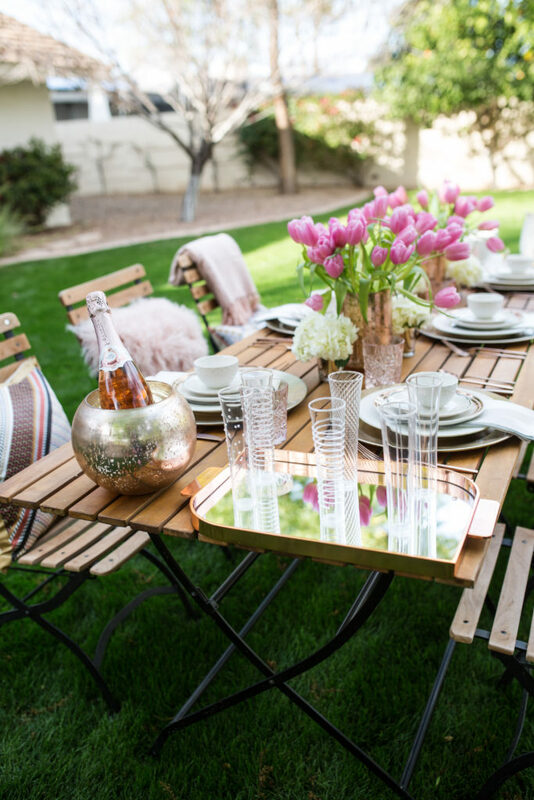 The delicate, yet whimsical flutes are my own, and the copper mirrored tray provided the perfect ambassador for the bubbly. 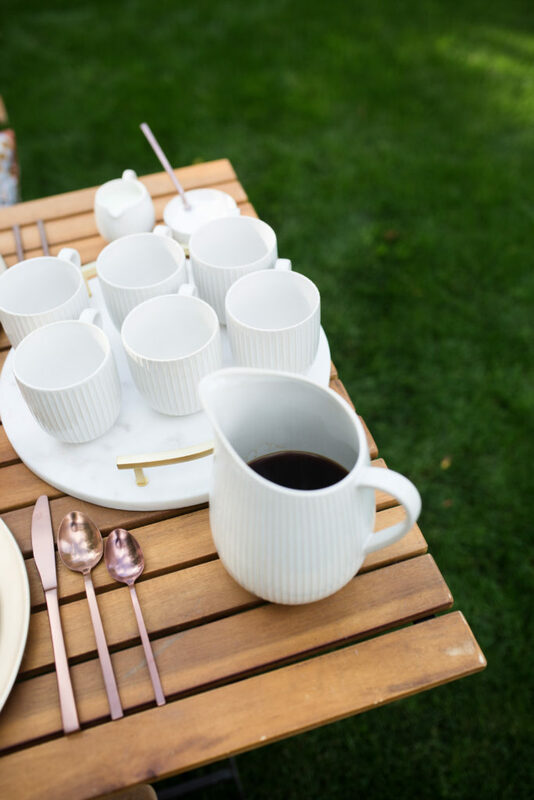 Line-patterned mugs, a pitcher and creamer from the Textured Dinnerware collection look prim and proper on this white marble and brass tray. Brass handles keep it current, yet timeless. I could see using this for serving desserts, on a kitchen island with flowers, or on a vanity with pretty perfume bottles… I might just use this forever. I really wanted to create an affair that was both elegant and comfortable. It was held outside, which naturally gave it a casual feel, but because it is Easter, I felt that it was important to still be reverent and meaningful. Each chair was adorned with a different pillow, all within the color scheme: one diagonal geometric patterned silk pillow, an ikat patterned silk pillow, and an inviting pink Mongolian lamb pillow. 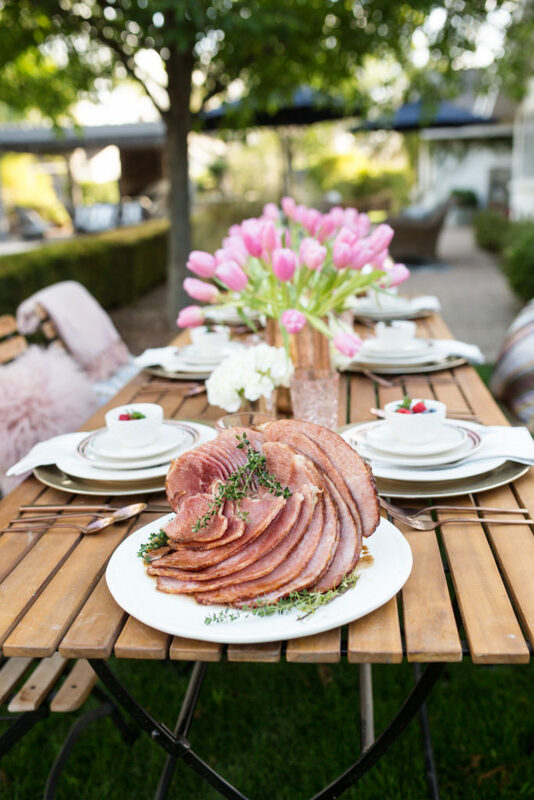 A cozy Easter brunch wouldn’t be complete without a few ultra-soft throws to cuddle in the crisp Spring air. These blush ones were perfect. You see this scrumptious Blueberry Cinnamon Coffee Cake above? I’m not even going to pretend I made it. My friend, Julie, who has mentored me in baking (no really, she has! ), generously offered to make this. The top is beautifully irregular and crumbly — just the right sprinkling of powdered sugar, and the fresh-from-the-garden blueberries and mint that gracefully crown this sweet treat. Thank you Julie, for graciously providing your family’s recipe! Pictured below is one of my favorite brunch dishes: lemon yogurt with berries. Ina Garten gets all the credit for this one — and I promise it is the best light addition to any breakfast or brunch! Eggs in a Nest has to be one of my most requested egg dishes, especially by my kids. There are a ton of versions out there — mine has five ingredients and only five simple steps. If you’re a visual learner, like me, you’ll love my step-by-step tutorial. Make sure to check it out! Isn’t the oval natural stone cheese board amazing? It has the perfect neutral-hued veining running through it that would work with any table setting. I used it here for my egg dish platter. 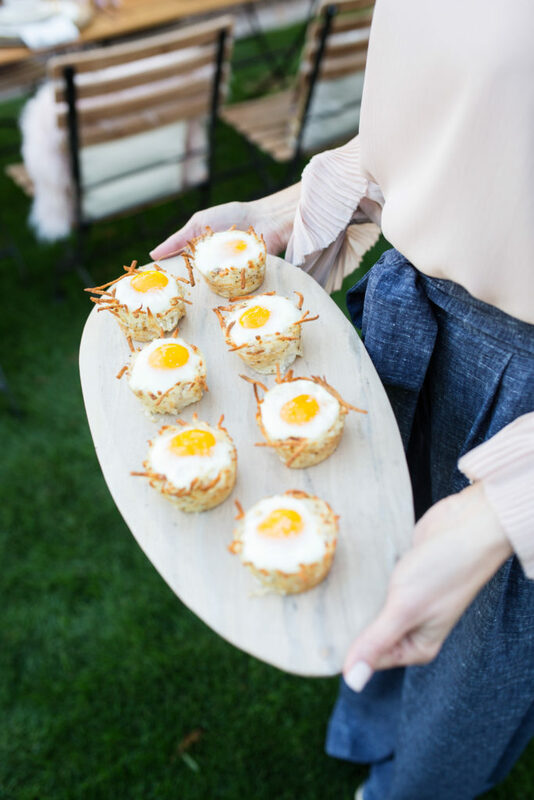 Don’t miss my simple step-by-step tutorial for this adorable egg dish! What would Easter be without a spiral ham? Costco was my go-to for this one, but it could easily be ordered from Honey Baked Ham or even your local specialty butcher. Thyme from my garden gave it a bit of color. 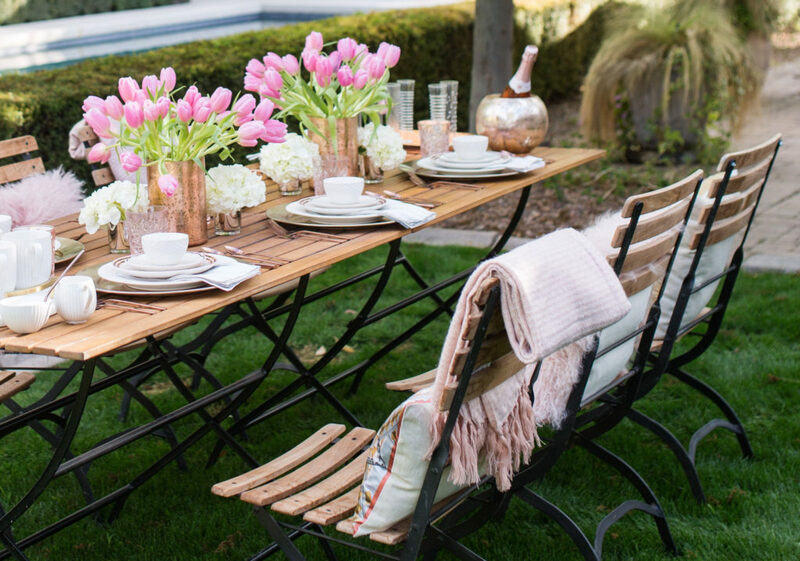 Now this is a stylish Easter brunch! Modern , yet so inviting! Don’t forget the coffee! You can’t beat fresh brewed java, along with some speciality flavored creamers, to round out this beautiful brunch.